More than a decade ago, Kelly Clarkson's name unexpectedly popped up in a now-iconic movie scene. 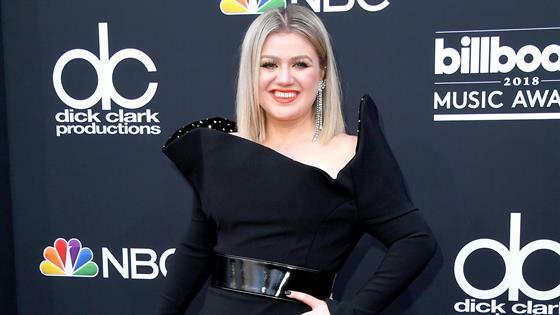 The film was The 40-Year-Old Virgin and, as fans well know, Steve Carell's character was in the process of getting his hairy chest waxed when—mid-rip—he screamed out "Kelly Clarkson!" "I was like, 'Is that an insult?'" Clarkson recalled thinking in an interview with E! 's Jason Kennedy on the BBMA red carpet. "'Cause you're like in pain and you think of me?" While we'd venture to say it was more of just an impromptu joke, the songstress ultimately got to meet Carell face to face at the Golden Globe Awards. "He was so nice!" she gushed. "I love when you meet people that you love and they're lovely. That doesn't always happen. He was so cool. His wife was so rad." "I don't even know what I was doing at the Golden Globes, but I was there. I got in somehow," she joked. As of late, we've fallen even more in love with Clarkson thanks to her candid excitement when it comes to meeting actors (Ahem, Meryl Streep). "I'm never around actors. I'm around artists, like singers," she explained. "I'm a very excited person." While we're sure that excitement will translate tonight on the BBMA stage, the star revealed that she was initially quite nervous to host because she was originally supposed to have a partner. "It was a co-host scenario—that's the only reason I said yes," she told Kennedy. "And then the other person dropped out." Ultimately, she's glad she took on the gig anyway and, after rehearsal, she's feeling good. "I'm gonna have a good time," Clarkson assured. And we can't wait! Break a leg, Kelly!